Our estate "Cortijo El Tobazo" is located in Alcaudete, in the province of Jaen, Andalusia, southern Spain. 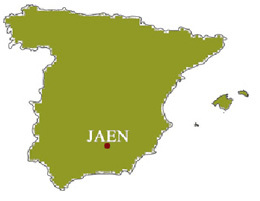 It is not only that we are located in the leading country in production of olive oil in the world, furthermore, we are in the first producer area of Virgin olive oil in the world: Jaen (around 50% of Spanish production and 20% of world production of olive oil is produced in Jaen). Olives have been cultivated in Andalucia for over 6,000 years and the region provides the perfect climate for nurturing this fruit with strong, bright sunshine and regular refreshing rain throughout the winter. Our farm enjoys an ideal situation, which confers to our olive grove an ideal environment for the organic farming and for the production of the best quality. Having an average height of 600 meters above the sea and a wide temperature range between summer and winter, allow a natural disinfection of our olive trees, keeping them safe from plagues and illness without the use of chemical products. Our estate´s extension is over 600 hectares and most of them belong to one single large plot. The mill is centrally located in the olive groves, allowing us to process the olives within 3 hours after harvesting (to limit oxidation and preserve maximum health benefits and flavour). The whole extension of Cortijo el Tobazo is exclusively cultivated using organic agricultural techniques, with the mentioned organic certificates of EU, Japan, US and China.